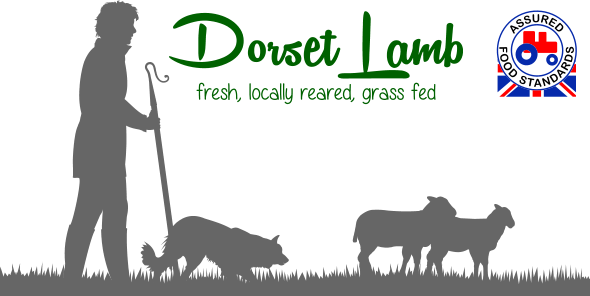 The lambs are reared naturally on grass, on the downs around the rolling countryside of Shaftesbury, in the heart of Dorset. The lambs enjoy a peaceful and stress free environment as you can see from our photographs. The lambs are checked twice daily so that any required medicinal and routine treatments can be carried out quickly and effectively as their welfare is of the utmost importance. Once the lambs reach the desired weight and finished condition, they are taken a short distance for slaughter. They are then prepared and boxed, ready for collection. We are passionate about supplying quality, fresh lamb to local people. People like to know where their meat comes from and much prefer to buy quality lambs fresh from the farm, inline with our ethos of traceability of food. Our premium lambs are excellent value for money. We are extremely proud that all our lamb is Red Tractor Farm Assured. If you would like to find out more about our lambs, please contact us for details. Just had lamb for dinner, it was amazing! Already had some chops, grilled and delicious. Packaged and presented beautifully, do we keep the boxes for next time?? Will be having a joint tomorrow.